Hello Everyone, as I am sure many of you have figured out by now, I am absolutely in love with textiles and pattern. My passion for textiles quickly emerged when I was in school for interior design. I love designing spaces and really love all aspects of the design process, but cannot lie, my favorite part is sitting in a room (or pile) of fabrics and selecting textiles and pattern for a project that will really make it come alive. It has been this passion for textile and patterns that led me to really start exploring how patterns are made, learning how repeats are created, and really beginning to play around with pattern design myself. I have designed patterns for custom textiles, wall-coverings, and rugs that are project specific and played around with designs for my own personal projects. I have a few patterns available for sale in my Spoonflower shop here. I am sharing this today because I am very excited about a new launch that will be happening. Studio Em Interiors is adding another aspect to our design services. I am in the process of rolling out Emi Marie Illustration + Design. This will be where I showcase all the Illustration and Surface Pattern Design work that I do for Studio Em Interiors and for other projects. There is a lot in the works right now. The website is being set up, along with social media, and we hope to launch products as well. Please head over to our website here, you can take a look and sign up for our mailing list to be the first to know when the site officially launches. Along with that, I will be using the mailing list to announce when all our new patterns are available in our Spoonflower store and the launch of other products as well. I am very excited and there is a lot that will be coming this year. Please head over to the site and sign up. 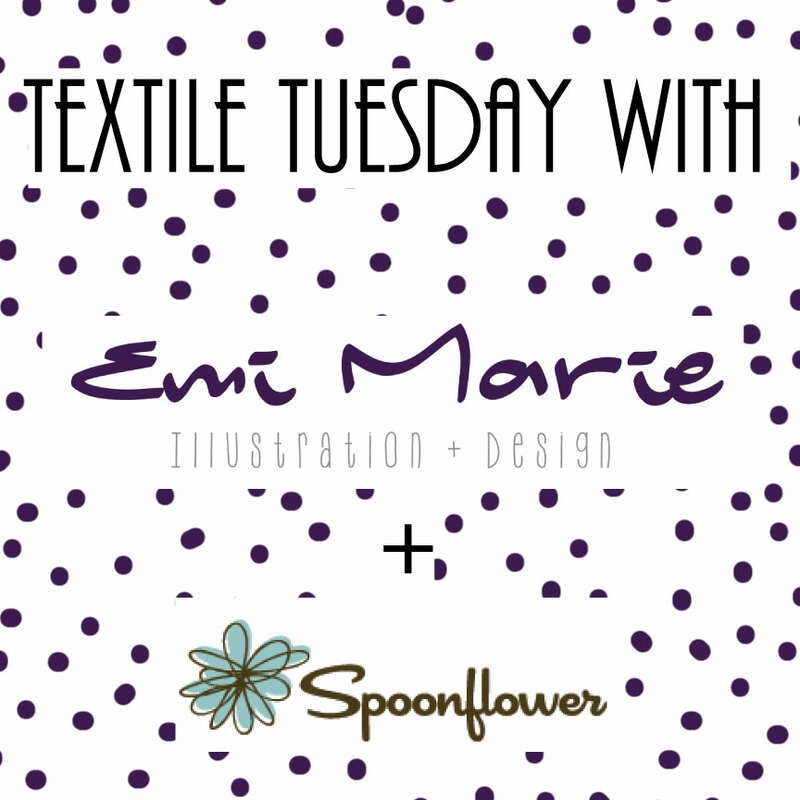 You can also follow Emi Marie Illustration + Design on social media on Facebook, Twitter, Instagram, and Pinterest. I look forward to connecting with all of you. Also, feel free to check out the (small amount) of work that is currently available for sale in my Spoonflower shop. These are all very early designs and I will be launch some really cool, exciting new patterns very soon.